The fundamental and essential function for every inbound call center companies is inquiry handling services. It is the process of providing the customer with correct and exact information about the product/services in a pleasantly and satisfyingly such that the customers will go for ordering more number of products. Isplchennai handles all the inquiries of the customer very smoothly, pleasantly and efficiently. This in return provides a path for business generation. We train our professionals carefully to have a thorough understanding of the product/services, so that our skilled experts can handle the queries by dropping the correct and precise information to fulfill the customer's needs perfectly and flawlessly. 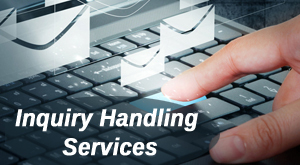 We deliver the inquiry handling services by means of supporting email, telephone response, managing information request, different language voice response, etc. We deliver absolute and timely service in order to provide better customer service. We also have a special quality team to keep track of our excellent inquiry handling service in the real time. To make your business success in this competitive world, we offer our clients with the best resources available and provide continuous support. Choosing Isplchennai for your inquiry handling services will deliver the clients with regular and detailed reports on monthly basis, providing technical supervisor help 24/7, reports with thorough review of activities every week if needed. Our specialty in inquiry handling services provides a good and quality customer relationship management thus benefiting the clients significantly to cast their existing products/services in accordance with the customer needs. Want to make your business successful in this competitive world? Then don't wait anymore. Contact us today to know about our unique features of inquiry handling services.